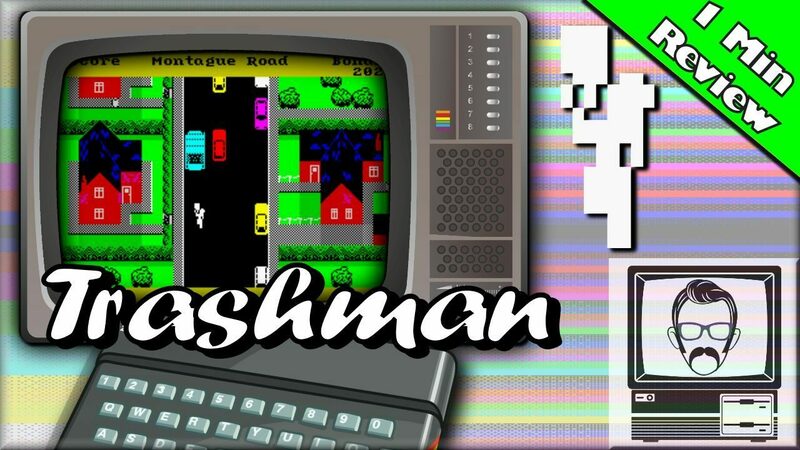 Trashman for the ZX Spectrum is a game I clearly remember from my youth, and indeed it’s regarded as a British classic today. Your task as the local binman is to collect rubbish/trash from the neighbourhood, dump it in your bin lorry and repeat for the entire street. As you work, you’ll encounter cyclists, cars, dogs and customers who’ll often want a chat, a game of scrabble or just need your help – this takes up time, but usually the reward of points and more time is justified. In this short 1 minute review, I’ll go over the game, it’s premise, it’s creators and my feelings. Better get started. If we’re talking about games which fire my imagination, and I am. Then ironically Trashman is one of my favourites. 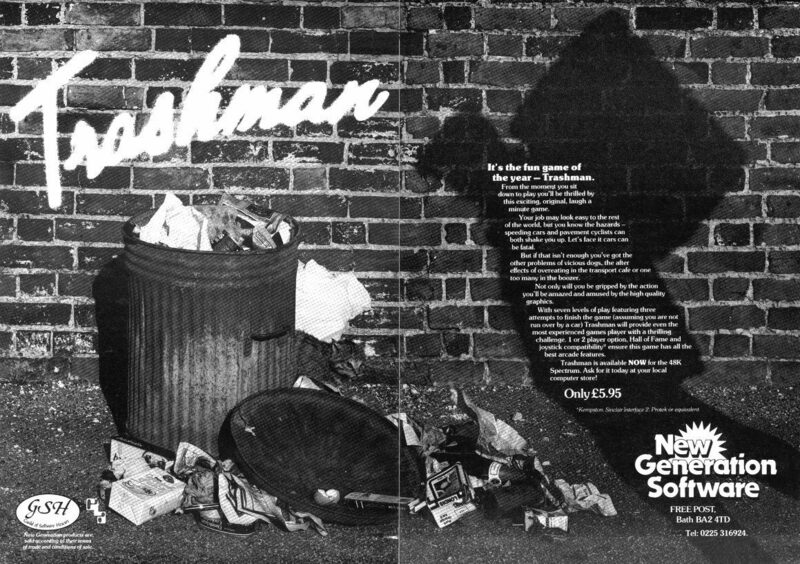 You might not expect it, given that the goal of Trashman is to collect trash from your average suburban street and lob it in the bin lorry. But there was something about that overhead view and the rather mundane and grounded task in hand. Published by New Generation Software, written by Malcolm Evans and released in 1984 for the Spectrum 48k the game received warm reviews, but has since gone down as an unforgettable classic. Although ported to other formats, this is the type of British game which made the Spectrum stand out. If it’s not toilet humour, then it’s trash humour and this has bin loads of the stuff. During your journey up the road you have to avoid cyclists, cars and even dogs whilst taking the shortest and most efficient routes to sure your dustcart doesn’t leave without you. You can even earn extra time by chatting to your customers. Complete the game and you’ll earn your diploma and can look forward to your holidays in the sequel, Travel with Trashman. As job simulators go, this is one of the earliest and finest I’ve yet to play.